« Foursome and Citgo to become…. If you remember there used to be a Jahn’s on Gerritsen Avenue and Avenue U now Chinar. Jahn’s ice cream shops once covered the NYC metropolitan area with a heady combination of lactose and sucrose. 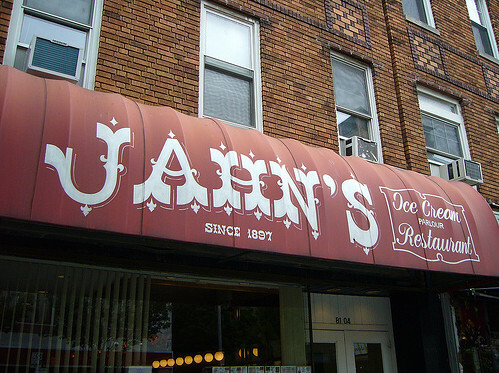 The first Jahn’s was opened way back in 1897 in Mott Haven, Bronx by John Jahn. His three children, Elsie, Frank and Howard, opened Jahn’s in Jamaica, Richmond Hill, and Flushing respectively. Jahn’s is most celebrated for its Kitchen Sink sundae, which was large enough to serve six. There were also the Boilermaker, the Awful Awful, the Suicide Frappe, Screwball’s Delight, the Joe Sent Me,, and the Flaming Desire, five scoops of ice cream topped by a flaming sugar cube. The Jahn’s at Richmond Hill, on Hillside Avenue just north of Myrtle closed this Thanksgiving weekend . It joins other former Jahn’s branches at Mott Haven, Jamaica, Flushing, Marine Park, Bay Ridge, Sheepshead Bay, Fordham, Forest Hills, Great Neck, Rockville Centre, Eastchester, East Meadow, West Islip, Union Twp. and Fair Lawn, NJ, and Coral Gables and Sunny Isle, FL. Tthe owner who said that after 18 years, they just couldn’t make it here anymore. The antique fixtures were purchased in bulk by someone who is restoring a period ice cream shop somewhere in the mid-west. One Jahn’s location remains: 81-04 37th Avenue, Jackson Heights, Queens. No way. This is great. I miss Jahn’s. I didn’t even know it was still open anywere. Oh so many lost years I have to make up for. Jahn’s was a birthday ritual until they closed here in Marine Park. That’s where you went after the school swim meets. After the movies (used to be right next door) and first dates; and just to hang out. Too bad, it was a great neighborhood place. I guess for people who have only been in the beach for a short while think of china as once being jahn’s , to people like me it was always Ray and shy’s The Flame . Jahns was on Nostrand ave till it moved to Gerritsen Ave after carval closed . are you related to the jahn family? Are you related to the Jahn family? My aunt and uncle (Klee) bought the original Jahn’s on 138th Street in the Bronx from Mr. Jahn and operated it for many years. I have photos of the original Jahn’s as well as a menu from the Richmond Hill Jahn’s. I have nothing but great memories about the old Jahn’s Ice Cream Parlor on Church Avenue and Flatbush Avenue in Brooklyn. We would make a meal out of their Kitchen Sink…. I spent many ‘date nights’ there Church & Flatbush . I lived on Maple St. between Nostrand & New York Avenues . Steve Sullivan ,now in Fla. and retired . I loved going to Jahn’s especially on your birthday. They would give you a free sundae. I used to go to Jahn’s on 86th St and Church Avenue (near Erasmus Hall High School) in Brooklyn and also Richmond Hill, Queens. It was the greatest ice cream parlor with the best selection of sundae’s around!!! I have such fond memories of Jahn’s in Union NJ. That was the hangout for all of us. I wish all us 60’s and 70’s “kids” from Union could open a Jahn’s back in Union. The kids today need someplace like this… The Kitchen Sink was the best!! The one I remember was located at the corner of 86th Street and 21st Avenue in Brooklyn. Worked there as counterman, busboy and waiter. Many great memories. The best part of Jahn’s other than the food and Ice Cream was the employees. When we placed the orders we had to scream them out in code – half on, purple up, black & white, split it straw and black “SINK IT” – which by the way was scoops of everything in the freezer, scoops of all of the toppings and three to four cans of whip cream. Topped with Sprinkles, cherries and four Melba cookies dipped in Orange Extract which was lit with a match before we brought it to the table. Melted Cheddar Cheese Burger deluxes, with TAB soda. French Fries with cheese and Brown Gravy. Definitely brings back fond memories. 86th Street in Brooklyn…Where is their best waiter..Robert ??? Grew up near Pelham Bay Park in the Bronx. Every once and a while a friend’s dad would take us all over to Fordham for an ice cream treat at Jahn’s. Those were the days!! I will treasure the stories of my mother going to Jahn’s when she went to Richmond Hill HS in the 60’s. I will treasure the stories I had in going there throughout my high school years in the 80’s. And I will certainly treasure the honor of having my daughter’s first birthday party there in 2000. Three Generations..Jahn’s you will be missed. Growing up in the 60’s in Brooklyn, I remember going to the Jahn’s on Church Avenue (next door to the Bowling Alley). When my grandfather came to town, the family would go to to Jahn’s and get the kitchen sink. Also remember the Blue and Gold Dinner (breakfast) for Boy Scouts was held there. In my teen years, moved out to Long Island where we went to the Rockville Center and Levittown locations. Rockville Center location is now called the International Cafe and I believe is owned by the daughter of the last owner of Jahn’s for Rockville Center. Once spoke with her, she said she still had a few Kitchen sink bowls. Today she makes Gelatto…. Growing up in Northern NJ, we used to go to the Jahn’s at the end of Route 4 in Fairlawn. It was our place to go for high school drama department cast parties, and always good for at least one Kitchen Sink. The main thing I remember from there (besides the great ice cream) was that all of the waiters and waitresses never wrote any orders down, and even when we switched seats around the table, or even changed tables to try and mess them up, they always managed to get our orders right to us. Hard to find places like that anymore. I went to the one in Fair Lawn for cast parties too! Even went there with my mother, and a few girlfriends. They always put on a great show. At he one on 86th Street in Brooklyn, there was a waiter (Robert?) who could take an order for a large party without writing it down and it would all come out exactly as ordered. Quite a talent. Thanks to Franco for the “insiders” information (see post above). Jahns was a great place. Sonya, if you ever read this, thanks for introducing me to Jahns. I remember going on dates to Jahn’s in Queens off Jamaica Ave.then to the movie theater next door. Just recently my daughter told me that she and her fiance also when on a date there last year. Oh those kitchen sink. Wasn’t there a bird bath? There was Jahns on Nostrand and U or are you thinking of the one that was on Gerritsen Avenue and Avenue U? Yes, there was a Jahn’s on Nostrand Ave. near Avenue Z…. There was another Jahn’s at Gerritsen and Nostrand (ner Ave. U corner) for several years… It opened in a site that had previouslty been The Flame Restaurant which literally had a flame coming out of a rooftop set-up. This Jahn’s did not have the ‘flavor’ of some of the other Jahn’s operations — the one that comes to mind first is the one at Church & Flatbush (but others swear by 86th Street). There was another great ice cream center nearby the Flatbush-Church operation – Fulton’s across from Loew’s Kings. The Flame was a popular restaurant for a while, and, when it closed, its site was used by Jaohn’s, but I never found this one to be on a par with Hillside or any of the others… Still…. what great ice cream. The family that created that ice cream is still very much around though no longer in the business, to my knowledge. “…Dedicated to Gerritsen Beach Offering Current News, Links & Reviews not Memories”. I must be on the wrong website. Is this http://www.gerritsenbeachmemories.com ? Who remembers taking a date to the Caton Inn? How many of you Gerritsen Beach and/or Marine Park readers, remember DeLeo’s? I have such great memories of Jahns. How sad that they are disappearing. I used to go with my friends after roller skating at Levittown roller rink as it was right next door. Then I brought my children there in the 60’s. I knew they closed but thought Richmond Hill one would stay open until I could get back there as I went there with friend from Flushing. Don’t put things off I guess because now too is closed. Will make it a point to get to the Jackson Heights one before that closes too. End of a beaufiful era. I feel badly this generation won’t have a chance to experience the McArthur sundae or Tub o suds. I was sad to hear that most Jahns are closed. I used to go to one one in the FORDHAM area with my grandmother when she would pay her gas bill.What a great place and many memories for me and my family….oh that great sunday on a hot bronx day and of course a seltzer water….!! There was Jahn’s in Sheephead Bay in Brooklyn but that took over when the one on the corner of 86th Street and 20th Avenue in Brooklyn closed for I remember some of the workers that were there went to work at the one in sheephead bay. Carolina was our favorite.. I didnt know your father owned Carolina and Gargiulo’s too ! I always loved the shot of sweet vermouth while we perused the menu in Carolina. The food was always delicious. I miss that place. There was a Counter Man Name John I use to call him Big John him and I were Big yankee fans . I wish I knew what ever happen to him. split, or a delectable Buster Brown !!! !—–oh yea!! …. those days are gone, but will never be forgotten ! I have a replica of Jahn’s Ice Cream shoppe on my train layout, purchased by one of my sons. It always creates an interesting conversation point for those visiting the Chase and Western Rail Way (i.e. my train room setup). It surely must have been a great place. I’d love to come in and pay with my credit card to see the reaction of the cashier!!! I went to Richmond Hill H.S.. After school we would walk to Jahns for some hang out time and something tastey.Barry was a terrific waiter and the the place was spotless and beautiful. The oldtime soda fountain was a marvel of polished brass ,nickel and marble.Bunches of bananas were hung for use in making the best banana split in the world.I think “Papa Jahn” invented that famous ice cream delight.The old nickelodian worked just fine and I always liked the “reverse in”…ablack and white soda backwards,chocolate ice cream instead of vanilla.Vanilla soda rather than chocolate./…Its gone,. Im 73, IT was a icon,like youth gone and forever to be missed. Wonder if Jaxson’s Ice Cream in Dania Beach is a relative. Looks just like the old Jahn’s of Fair Lawn and was told the name came from “Jack’s son”…Outrageous homemade ice cream! I asked that of the owner of Jaxson’s once and he told me that Jaxson’s actually predates Jahn’s. He also said that they have the copyright on the “Kitchen Sink” ice cream name, but never minded that Jahn’s used it and made it. Jaxson’s reminds me a lot of Jahn’s and the way it used to be and I go there every time I am in the area. Hi I went to Bronx Community College and then to Lehman College back in the seventies and we all stopped in about once a week at Jahn’s on Kingsbridge Road in Fordham for lunch and an ice cream treat. It used to be our regular spot to sit and talk about school, our boyfriends or boys that we would like to be our boyfriends or to moon over that cute young professor. 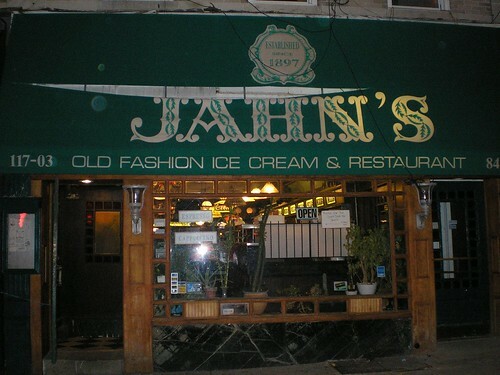 Jahn’s was the best of the best as a hangout place second only to Arnolds on Happy Days. Come to think about it I believe that the executive producer Gary Marshall came from the Grand Concourse. I wonder if he ever went to Jahn’s when he was a teenager and Jahn’s was a prototype for Arnolds. Although I am not sure when Jahn’s actually opened up at that location. Which brings me to my reason for writing.Why not bring back Jahn’s. As far as I know there is nothing like it anymore anywhere. I believe it would be a success. The kids today don’t have anywhere to go and hang out with friends just fast food places like McDonald’s and the like. (Does anybody remember the sign in Jahn’s stating that “GOOD FOOD TAKES TIME TO PREPARE”) I am sure that they serve a purpose but they could never begin to fill the void left by Jahn’s and other places like it. It could not only serve as a teenage place but a family place, date place etc. I think we should start a bring Jahn’s movement and mabey some big mall or food company will look into the possability. It’s worth a shot. When I used to tell my kids about Jahn’s they thought it was something like Friendly’s but I told them that it was like that but so much more but they could not imagine it. I say let future generations not have to imagine but instead be able to sit down to a kitchen sink or a buster brown of their very own. What does everybody think about this? Coments please. Maybe I served you some ice cream back then. I worked there for many summers as my father was the manager. I thought the road name was Kingsborough but you are right it was Kingsbridge Road, very close to Fordham. I worked there during school summers, probably from about 1972 to 1978. Was your Dad the manager of the Flame? And is his name Ray? I lived in the Bronx from the time I was born in 1950 until 1976. Jahn’s was where we usually went after a movie date. Fordham Road and the Grand Concourse was host to Loew’s Paradise, RKO Fordham and the Valentine theaters. I remember too that Jahn’s had a party room and was a favorite spot for wedding and baby showers. I never had any food there, only ice cream. It was a good time, looking back. Robert – nicknamed “SHEK”. Yes a person of German ancestry. Heard through the grapevine he owns a German Restuarant someplace in Queens (not sure where or the name). Many many great memories from working at Jahn’s. I use to go with my family to the one in fairlawn nj. I remember the old time movie projector and the great lollipops at the counter the clear red, green, yellow,ones in a 5 pack shaped like a boot or something like that. I wonder if they one place left has them. It was great memories. Could you make a copy of the menu and send it to me? It would be most appreciated. It was the best of the best as a hangout place. There was one Jahn's left out of the list. It was in downtown Huntington, next door to The Shore theater. It nwas the site of my first paying job. I went to Jahn's in Queens on my 22nd birthday, November 15 1974. I remember I had the Free Birthday Sundae and my date had The Kitchen Sink, which was way-way-way too much for one person. We switched sundaes. He ate mine and we worked on The Sink together. i would love to go back, but, alas, I can only visit in my mind. The last time I went in Jahn's-Richmond Hill was 1996. It had turned into a real sleazy dive. Only two people working the place. A filthy looking unshaven Russian guy working the grill while watching a grimy little b&w tv behind the counter, and a busted looking waitress. They had just done a half-assed remodel job removing most of the vintage tables and paneling, the place was already run-down looking again(minus the character). I never went back. I can't believe the place held out almost another ten years before finally shutting. Poor management killed that place. Another place in a slow downward spiral is the Homestead on Lefferts Blvd. That's a real shame too. been going here since I was a little girl though out the 90's. the last time was in 2007. great time. will never forget that old music box. had my name on the wall. such a real shame. another lost piece of history. I use to hang out at the Jahn's on Church and Flatbush on Friday nights after ice-skating in Prospect Park , in the mid – to late 1960's. Does anyone have a picture at that location? I have many fond memories of Jahn's ice ceam parlor. I worked there as teen. I worked as a dishwasher, busboy and kitchen helper. I also remember very fondly working with the son of the owner or head manager. Mr Cavanagh, can you give me a heads up on the people that worked at the Kingsbridge parlor in the mid to late sixties. My dad was the manager there for many years until it closed. My dad was the manager for many years, probably starting in the 60's. My oldest brother Allan worked there for many years and I did too. i used to live at the jahn's on hempstead turnpike, levittown, just west of the wantagh parkwy on the north side of 'the pike'. . . after roller skating at the 'levittown skating rink' , it was a requirement to stop at jahn's and cool down. it was almost criminal when they closed it. many happy memories . . loads of good food. My father was the manager of the Jahn's in the Bronx, Kingsborough Road. I worked there for several summers as a busboy, dishwasher, behind the counter whatever he needed done. I can remember Frank Jahn coming to our house to visit and I can remember him and his wife visiting the store each week. Great memories. I used to walk around that area of the Bronx before the store would open just taking in all the sites, very interesting place. Worked with some great people over the years too at Jahn's. I can remember making Kitchen Sinks along with all the other ice cream creations we had. Wasn’t there once a SuperDooper for Two? I also put it thru to find out if it is still around. Interested in knowing. JAHN’S Route 4 Fairlawn N J is still around. Thank you! I grew up in Fair Lawn, NJ … and Jahn’s is long gone from Broadway (Route 4). It is now the River Palm steakhouse. Many wonderful memories of Jahn’s. Plan on visiting the last survivor in Jackson Heights, NY soon! The kitchen sink. The place was as serious an ice cream parlor as there ever was. It was old fashioned or tried to be. Gay ’90’s was how I remember it. The NY area “luncheonette” wasn’t as fancy or as expensive back then. such a loss. cranford cougars went there after every wrestling match that we won (1980’s) to union. kitchen sink was always on the menu. The wife and I first went to the Jahn’s tonight. We live a few blocks away. Old school atmosphere which i found comforting. The people there were great and so was the dessert. We will be regulars! doubt it. Maybe you have a time machine. If you do skip Jahns & buy some lottery tickets. IS THERE ANYWAY I MAY BE ABLE TO GET A MENUE OF JAHNS ICECREAM PARLOR? You can find them for sale now and then on Ebay. How about the one on 86th Street & 21st Ave. SORRY TO HEAR OF THERE CLOSING(JAHN’S)A LOSS TO ALL.WORKED BEHIND THE COUNTER FOR 11 YEARS PART TIME.MET MY WIFE WHILE I WAS THERE AS DID MY BROTHER.SEVEN DIFFERENT LOCATIONS BUT MOSTLY IN RVC.WAS IN FLATBUSH ON OPENING DAY,WORKED 21 HOURS STRAIT AND THE LINE WAS STILL AROUND THE CORNER WHEN WE LEFT.TONY A.WAS THE OWNER(88)JUST THE BEST YOU COULD WORK FOR.GREAT MEMORIES ,GOOD FOOD ,FAST SERVICE AND IF YOU ATE THE KITCHEN SINK BY YOURSELF YOU GOT ONE FREE!!!! I am named (in part) for the RKO Keith’s next door. My dad (Ken Polsley) used to manage the Richmond Hill store, then he oversaw the opening of the stores on LI and in NJ. I remember driving around with a gas streetlamp in our car several times. there was on in every store he opened. My mother’s name was carved into at least one of the tables along with probably thousand’s of others. I think they met there sometime in the ’30’s. The nickelodeon and open-air garden in the back were two of my favorite things after the ice cream of course. Wow, it’s great to hear thay someone is connected to people who wrked in Jahn’s years ago. My Dad, Ray, worked there for years when he was in high school and after he came back from the service. His brothers worked there too for years. My Grandparents actually lived on the 3rd floor apartment above Jahn’s. There apartment was the entire top floor that went all the way to the old A & P.
also worked in the projection booth at the RKO Keith’s too. He was a sods jerk at Jahn’s. He worked for Frank Jahn. Did your Dad happen to work at the Flame in Brooklyn? The Jahns on Kingsbridgege Rd was our date place. After movies at. Forham, or Lowes Paradise. Many memories from 1970-1978. We always went to Jahns in East Meadow next tot he Levitown Roller Rink. We would all chip in and get the kitchen sink. Ahhh… the teenage years in the late 70’s… the good old days. I remember Jahn’s on Church Ave and Flatbush, we would go to the movie and then to Jahn’s, that was the best time! I have a menu from Jahn’s that I have saved. I am not exactly sure how old..I would say at least 49 years??. The price of “The Kitchen Sink” was $6.50!! !It says Bayside on the right top side. It was printed by Wilburn Co, NY. I treasure this menu!! It was the first time my Uncle took me anywhere alone. I still remember how excited I was that he asked if I could the the menu..anyway..was glad to find the information on the history have been looking for a long time..
my friend fred and i shared a kitchen sink 1958 at richmond hills great memories. I always heard of Jahn’s but had never gone to one as there was none close to where we lived. In 1958 when my husband and I moved out to Bay Shore, long Island,NY there was one on Sunrise Hwy. in West Islip 2 miles from our house, well I made up for lost time until it closed. It was on the Sunrise Hwy side of Korvettes Shopping center.My girlfriend and I went quite often for lunch while the kids were in school. it was quite a disappointment when they closed. The shopping center changed and now there’s a McDonalds in just about the same spot Jahn’s was. When I was young we always had a candy store to hang out in and the owners didn’t mind. Today no one would stand for it. It’s a shame because there is no place for them to hang out. Those were fun day’s and you looked forward to hanging out withe your frieds. We hung out in Chuck’s candy store on Ditmars Blvd. in Astoria, NY. We still talk about those times. But there never be another Jahn’s, everyone remembers Jahn’s but nobody ever heard of Chuck’s. Can someone tell me the name of the Disco that took over the Jahns in West Islip I think it was aroung 1976-77? Does anyone have pictures of The Flame Restaurant? My Uncles Ray and Shy owned it. Uncle Ray pasted away earlier this year. Was the Flame on Flatbush Ave near Church Ave? The Flame was on Ave U & Gerritsen Ave. SE Corner. Jason, could you please email me. At kadoria @aol.com, concerning Ray. My dad owned the Jahn’s in Rego Park (the original one next to Matty Young’s)in the late 1950’s. My dad owned the Jahns in Rego Park in the fities and sixties. He had to change the name to Baronets after some discussion with the Jahns family. I grew up loving the one in Jackson Heights, Queens on 37th Ave. and it’s still there! My 6th grade “boyfriend” took me there after our graduation from elementary school. And I have so many other wonderful memories of the place. I must go back there and have a sundae! My Dad never had time to do much fun stuff with us kids back in the ’70s. But I will always remember the day he took me and my 2 friends to see the Mets at Shea and then to Jahn’s on Queens Blvd. The ice cream was the best part of the whole day. Sadly my Dad is gone now, as are Shea and Jahns…. So many lovers carved the names of their beloveds into the wood work at Jahns on Hillside that it could have been declared a “WORLD HERITAGE SITE” LOL. 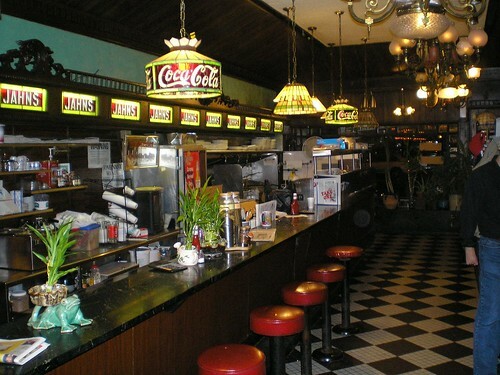 THAT MASSIVE oldtime soda fountain behind the counter was something to behold. ICE CREAM PARLOUR, does such a thing exist anymore? BLOOMBERG WOULD HAVE DECLARED THE “KITCHEN SINK” a hazard and illegal. In my day it cost an astronomical $6.50. I would pay $6.50 for a real chocolate “egg cream”,totally unknown here in the “boonies” of Western Canada. Those were the days my friends, we thought they’d never end. Reading all these wonderful comments about Jahns helps bring back a lot of great memories. We are so lucky to have experienced things when we did with such great people. Going there was such a treat. The one I went to was on Queens Blvd in Rego Park just a few steps away from the Trylon Movie Theater and how great it was to go to the movies and then out with friends to this wonderful ice cream parlor. Does anyone know when the Jahn’s on Nostrand Avenue and Avenue Z closed? Was that a Jahns ? yes, it was. kouros greek diner is there now. The kp diner is now cvs. It was a nice diner. I miss da food. Does anyone know how many names,there were for icecream combo’s. I do remember there were alot, but how many?. I used to work as a waitress in Jahn’s during the early sixties. I don’t remember all of the code but I do remember that and in was an ice cream soda, an up was a dish of ice cream and an on was a sundae. Chocolate and strawberry ice cream combo was called a flatbush, 1/2 was chocolate and vanilla, broadway was coffee and chocolate. Hi Ho was a Tall in the saddle, Deleware Square was pound cake, ice cream, hot fudge, and whipped cream. I have a lot of memoriabilia from my days working for Frank and Grayce Jahn and gifts of jewelry that were given to spouses of managers at the Christmas parties. I attended the their granddaughter’s wedding on Shelter Island back in I believe the eary 70s I worked in Richmond Hill while I went to college and have many good memories of the fun we had. About 8 yrs ago I did revisit while attending a funeral around the corner and was sorry I had because the ice cream parlor no longer belonged to the family and things had changed. Suprisingly the Frank Jahn’s paintings were still hanging on the wall with the exception of his self portrait that was hanging on the wall behind the cashier’s booth which was also gone. My years and the people I worked with and served make for very happy memories. Went to RHHS in tne fifties. We used to “hang out” on the corner when we weren’t inside Jahn’s in Richmond Hill. What a wonderful place. That’s where many of the good looking girls from Richmond hill “hung out” on summer nights. When we reached our senior year in RHHS in 1957 and turned 18, we would walk accross the Street to Glenn’s Bar and drink beer. Many summer nights we would go around the corner and walk up the RKO Kieths’ fire escape, where Denni, who was an usherette in the Kieths would open the fire escape door so we could sit in the Balcony and smoke while watching the movies ! Jahn’s had the coldest ice cream. It was ice cold. Eat it too fast & I’d get that burning sensation in my chest. Also I remember how elegant the shiny silver dishes & spoons were. A lovely place to eat, except the fare was ice cream not dinner. Zaharakos has a museum that displays lots of old fashioned ice cream memorabilia. I remembering seeing several items attributed to Jahn’s. Fondly remember Jahn’s on 37th Avenue in Jackson Heights, haven’t been there since my parents moved. The ice-cream parlor mentioned above across from the Loew”s Kings on Flatbush Ave. Had chunks of butter in their butter pecan ice-cream! There was one on 86th street and 21st Ave. I went to Lafayette HS and I fondly remember going to Jahns after and event at school with many of my friends. I do miss those days. Remember Jahn’s on Sunrise Highway in West Islip very well. I remember that one on the North side of Church Ave. I have memories of my Dad taking me to Jahns as a child. I have always wanted to have the Kitchen sink for dinner. I recall watching people eat that huge concoction. This is on my bucket list. I haveto make my way to jackson Heights and go for it!! I remember the one on Miracle Mile in Coral Gables, Florida, everyone would go there after a movie in Miracle Theatres or after walking the Mile. Delicious eye creams. Great memories of the place. I worked at flatbush ave. Jahn’s ice cream section in 1969-1970 summers. My cousins owned it. They were ice cream manufacturers located east new York Ave and utica. Their name was Kroll. I remember that Jahn’s , the place was great. Ice Cream was not bad neither ! I remember the formula for the kitchen sink. I believe the cost back then was $6.25. If anyone is interested in the “secret” as to what really went into the kitchen sink back then I will share it. is jans still open in fairlawn nj? I worked at Jahns in West Islip when I was a teenager.Great food and people, I sure miss that kitchen sink. I remember going to Jahns after sporting events. I went to Lincoln H.S. and one night we beat Sheepshead H.S. In a big basketball game. Everyone ended up at Jahns on Nostrand Avenue. We were having the usual- burgers, fries, and sharing kitchen sinks. Tensions wre high in the restaurant. After eating everyone poured into the street and the fighting began. Good old Brooklyn! My Dad used to go to the Jahn’s in Union, NJ. His favorite? The Awful Awful. North Miami Beach a bit far away ? ?